In our fast-paced, modern lives things are changing all the time. The old feels boring and simplistic, and the new looks alluring and shiny! This principle works for all sorts of tech and fashion products, but it also works for sports, as well. A lot of people play football on the weekends or meet up with a mate at the gym for a bit of squash every week. Unfortunately, once these things become habitual, it’s a struggle to try anything new. So, in an effort to inspire you, this post will help to find some unique and interesting sports, and also help you get into them. Zorbing isn’t exactly a sport, at it’s heart. It was originally designed as a thrill seeker experience. You get placed in a large ball, or “Zorb,” and then rolled down a hill. The ball has an outer and an inner layer. The inner layer is attached to the outer, with a large gap of pressurized air in the middle. This gives the ball a lot of bounce! You sit within the inner ball, protected from the ground below. To make Zorbing into a sport, you use level ground instead of a hill. This gives each player much more control of the ball, allowing proper movement. In this position, the balls can be used to race. Because the balls are almost entirely filled with air, they float. This means that you can also race with Zorbs on water, just to spice it up a bit. Bubble Soccer as a game plays in the same way that football does. You play on a rectangular field, with a goal at each end. Each team has half of the field, and scores by getting a ball into the goal on the other half. But, with bubble soccer, each player wears a suit akin to a Zorb ball. 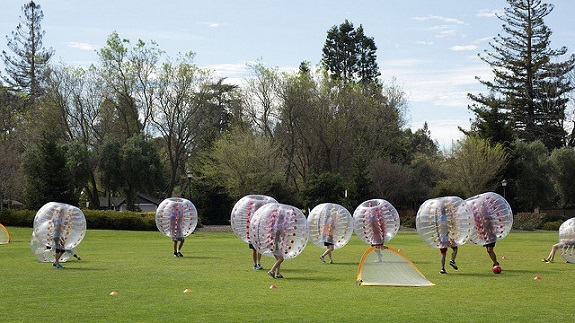 Unlike the Zorb ball, bubble soccer suits only cover your upper half, leaving your legs exposed. Wearing a ball and playing football sounds a little silly, and it is! Because of the reduced field of vision and mobility caused by the suit, players struggle to even touch the ball. Any collisions between players send them flying. The pitch quickly becomes a mess of players trying to find the ball and get a goal. This game is incredibly fun and will push any players to their limits. It’s a little more traditional, but, if you like some adventure, archery is a great sport. All over the world, you’ll find archery centers and a lot of them offer weird twists. One variant of traditional, down-range archery, is archery tag. In a game of archery tag, players all have a bow and a set of arrows. Arrows are soft and blunt but will leave a splodge of paint on whatever they hit. Games are usually played in a large open area, with places to hide. It operates on a last man standing basis, and players are knocked out when they are hit by an arrow. This game can be played with two or more people, and can be adapted into your own unique game. Of course, these sports won’t appeal to everyone. But, how do you find a weird sport to try for yourself? Thankfully, it’s not too hard. The first place to look is Google; which is convenient, and you’re probably at a computer right now. Search for weird and unique sports, To try and find something that appeals to you. It’s also good to look close to home; as some sports are very localized. Check out local noticeboards and community newsletters, and you’re bound to find at least something. You can also widen your search to other local towns. Look into the town’s histories to try and find weird traditional sports, as these are likely still held today. Getting your hands on the gear for weird sports is often expensive and time-consuming. But, thanks to the Internet, it doesn’t have to be. To save money, it’s usually better to look for second-hand items. This will give you a chance to try the sport, before committing to the expense of brand new kit. Buying sporting goods new takes some research. Use Google’s shopping search to find comparisons between products, as it will show you products from loads of sites. And look for specialist forums and stores, as they’ll always have great leads. Now that you’re inspired, all you need to do is go out! Remember, at the end of the day, you’re doing this for one purpose; fun. Don’t stress yourself out if you can’t find something new and exciting, as sometimes routine can be good!